Jackie orders room service for her team. Melissa calls Teresa in hopes of mending their issues. They decide to meet downstairs to hash out what happened as it affects their relationship. Melissa cites that Jennifer is a horrible drunk, but Tre counters that Margaret is just as bad but she doesn’t drink. When questioned about her newfound negative feelings towards Margaret, Teresa claims that accusations of adultery are her limits given what she’s gone through with Joe. Melissa recognizes that Teresa has a lot of (misplaced) loyalty with Danielle, but she implores her to give Margaret a chance to explain her side. Back in New Jersey, Margaret recaps the vacation’s craziness to her mother, Marge, Senior, but she really wants to focus on her upcoming fundraiser to create fun hospital gowns for kids battling cancer. She reveals that the ladies all took home separate flights from Cabo, but she is hopeful the drama from Mexico won’t bleed into her upcoming fashion show. Margaret regales in her cabernet toss on Danielle, but she hates that it’s bringing down her friendship with Teresa. She texts Tre requesting a meeting. Likewise, Melissa and Jennifer are (separately) reliving the chaos in Cabo with their husbands…although Jennifer’s husband is reluctant to tell share her actions. As he eats dinner apart from the children while sitting in a black velvet throne, he is amused by Margaret’s self-purported lies about the good doctor’s infidelity. Bill Aydin isn’t quite sure what to make of his wife’s admission of glass breaking. She requests that he accompany her to Margaret’s charity event. He wouldn’t miss it for the world…not to defend his wife, but just to be closer to the entertaining madness. Dolores and her ex-husband bestie Frank Catania are washing cars together, and he wonders if their odd relationship is holding her back from finding happiness with someone else. Teresa brought up this conundrum, and while he loves her, he doesn’t want to keep her from dating. Across town, Margaret and Teresa are meeting for appetizers and a truce. They delve into Cabo’s shenanigans, and Tre admits that Margaret’s accusations of Bill cheating were a trigger for her. She is also curious as to how Margaret could drop Danielle as a friend without a second thought. 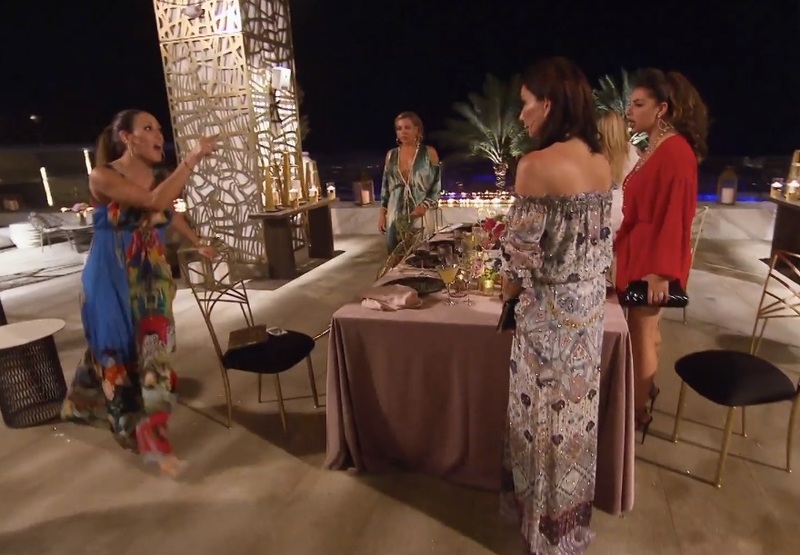 Margaret tries to explain her downfall with Danielle, but she fails to mention that Danielle once caused Teresa to THROW A TABLE AT HER IN FRONT OF ALL OF THEIR KIDS! Margaret is worried that Teresa isn’t seeing Danielle’s red flags, but she knows it’s something Teresa must figure out for herself…again. Jackie is reveling in family time, recognizing that drama has no place in her life. She decides to reach out to the sister she hasn’t spoken to in fifteen years to attempt a story line reconciliation. When her sister answers the phone, Jackie is thrilled, and the two make plans to connect in person. Her husband is also excited about the breakthrough. Meanwhile, Margaret is putting the finishing touches on fashion show fundraiser. She’s hoping that by inviting her ex-husband and his estranged son, the beauty of what she’s trying to accomplish with her hospital gown line will rub off on them in the form of warm fuzzies. After a successful phone call with her sister, Jackie heads to Envy to confide in Melissa about the positive stop in her sibling relationship. Melissa relates Jackie’s news to being similar to when her husband Joe disparages her boutique to their daughter because he doesn’t think women should work. Kind of the same, right? RELATED: Real Housewives of New Jersey Recap: That’s A Rap! It’s the evening of Margaret’s fundraiser, and no detail has been overlooked. She fusses over last minute details and heaps gratitude on the people working the event before greeting guests. Margaret’s ex-husband Jan arrives with his new girlfriend…who happens to be best friends with her current husband Joe Benigno’s ex-wife. Small world! Dolores is impressed that Margaret invited Jennifer to this event given the crap that transpired in Mexico, but she realizes that this cause is bigger than the ladies’ pettiness. Margaret welcomes Jennifer and Bill with grace and humor over the Cabo antics. Relieved by Margaret’s olive branch, Jennifer searches for Dolores to lather, rinse, repeat. Dolores accepts Jennifer’s apology with the caveat that Jennifer needs to make nice with Melissa. Taking Dolores’ words to heart, Jennifer goes looking for Melissa. She offers a sincere apology after Melissa questions her tequila intake. Jennifer remains humble as Melissa bristles. In the end, Melissa realizes that it takes a lot of guts for Jennifer to admit her wrongdoing. Across the venue, Joe Gorga and Bill are laughing about their wives’ beef. Bill really tries to keep Jennifer away from Jose Cuervo! Margaret opens the event with passionate words about why she’s chosen this cause. Teresa is quick to say that anyone who can do so much good shouldn’t be on her naughty list. A tearful Margaret relinquishes the podium to some amazing kids who have survived cancer. Thanks for the tears, Bravo! The night is a grand success…both the fundraiser and the lack of drama…until Jennifer’s anniversary party next week anyway! TELL US – WHAT DID YOU THINK OF LAST NIGHT’S REAL HOUSEWIVES OF NEW JERSEY EPISODE? DO YOU THINK JENNIFER REDEEMED HERSELF?